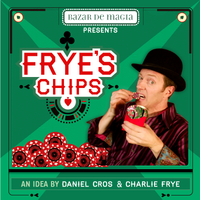 Today, when you order "Frye's Chips (DVD and Gimmicks) by Charlie Frye - DVD", you'll instantly be emailed a Penguin Magic gift certificate. You can spend it on anything you like at Penguin, just like cash. Just complete your order as normal, and within seconds you'll get an email with your gift certificate. This is a great gimmick and DVD. Obviously as it has been released by Charlie Frye one of the best entertainers around. The gimmick is easy to use and it really turns heads and has people uttering expletives. This is a con juggling trick. A great attention getter. I combine this with a chip flurry.People always want to see the spin again. The DVD contains the spinning cig paper which is a fun trick as well. This is well worth the cost. Charlie Frye is great. But to demand $ 40 for this trick is too much. For this, the trick is too easy. Much better tricks are available for download at Penguin Magic for $ 5 or even free. Sorry Charlie this is rip off. Chips is very clever and I look forward to finding the right place to perform this in our routines. Frye's chips is 1 cool f/x but I do this as a site gag after performing my own unique version of 3 fly (where it is a flying coins from 1 hand 2 another routine with the twist of multiplying coins)Many think there R more than 1 extra coin so I play on this at the end of my routine the table have over a dozen coins. 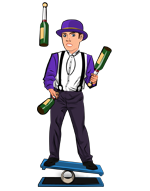 When the crazed crowd settles down I do a 3/4/5/ casino chip juggle taking away 1 chip till I am juggling just 2 chips & them if they think 2 are ez it hardest 2 juggle 1 chip and do the f/x. I do say it is more than it should cost but the presentation on the well done D.V.D. and creative method makes this a great visual after ANY chip trick. I love the Frye Chip and keep it in my pocket, ready to go. People LOVE watching this as they think it takes great acquired skill. But it doesn't. And you aren't limited to just spinning the chip on your finger. You can go into a classic one coin routine ala Slydini/Roth.